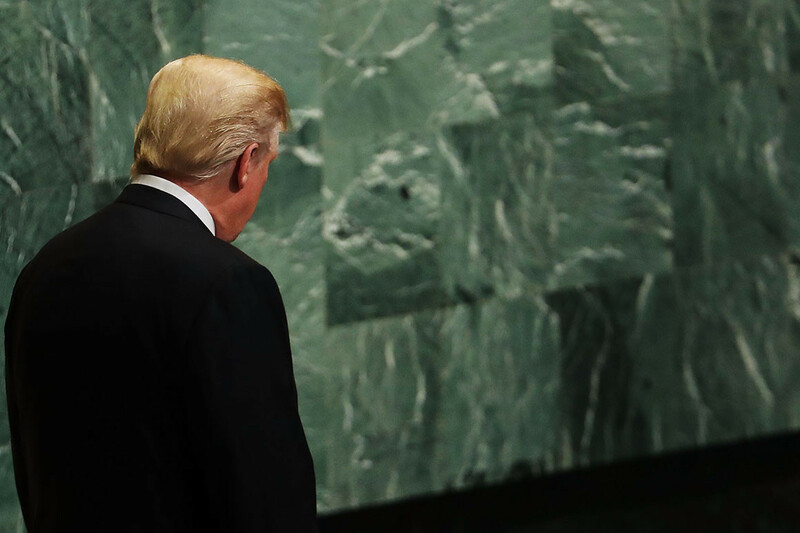 Donald Trump sees the U.N. General Assembly as a chance to condemn Iran — but U.S. allies plan to tell the president he’s the problem. Donald Trump sees next week’s main session of the United Nations General Assembly as a chance to condemn Iran for spreading what he’s called “chaos and terror” through the Middle East. But many key U.S. allies will likely use the global forum to present Trump himself as a threat to world peace. The result could be an unusually combative gathering at an annual forum meant to promote harmony among world leaders. “It’s not going to be a pleasant conversation,” predicted Ilan Berman, senior vice president of the conservative American Foreign Policy Council. Trump’s expected barbs against Iran in New York also come with political risk — and potential rewards: Talking tough on Tehran will please Trump’s Republican base, as well as Israel and some Arab states. But the broader reaction could expose how isolated Trump is on the world stage, especially after he unilaterally quit the Iran nuclear deal this spring. Mindful of the danger, the Trump White House has already dialed back plans to dedicate a session of the U.N. Security Council that Trump himself will chair to the subject of Iran; the meeting will now cover the broader subject of non-proliferation, which could comprise other issues like North Korea. Officials worried that Trump could appear to be all alone on a Security Council with many members who believe he should not have withdrawn from the nuclear deal. But Trump’s speech to the General Assembly, set for Sept. 25, will include tough anti-Iran language, an administration official confirmed. And Iran’s behavior is still expected to come up during the U.N. Security Council session Trump will chair, tentatively set for Sept. 26. Trump and his aides are sure to denounce Tehran over its sponsorship of terrorism and its military interventions beyond its borders — what the White House refers to as “Iran’s malign activities.” They will likely also claim that Iran, despite still clinging to what’s left of the 2015 nuclear deal, has never truly fulfilled its end of the agreement to scale back its nuclear program in exchange for economic sanctions relief. Throughout the U.N. gathering — which began this week with lower-level meetings before the leaders of participating countries speak next week — a slew of side events, forums organized by activists and bilateral meetings between Trump and his counterparts will give all sides a chance to air their views. This Wednesday, Brian Hook, who heads a newly formed State Department group to coordinate Iran policy, will speak about Iran at the conservative Hudson Institute. Within the U.S. government, there’s been “a renewed push to include anti-Iran talking points in all engagements,” including the General Assembly, a former administration official briefed on the topic told POLITICO. But European countries, led by France, Britain and Germany, and unofficially backed by Russia and China, don’t intend to let the Trump team hog the microphone. And America’s European allies have been clear that they will not bow to U.S. demands to scrap the nuclear deal. Last week, European officials announced they are working on a range of measures to stymie the impact of renewed U.S. sanctions on Iran so that Tehran can keep doing business with Europe without fear of U.S. punishment. A spokeswoman for Federica Mogherini, the European Union’s foreign policy chief, took a pointed shot at the U.S., noting that the nuclear deal was unanimously approved by the U.N. Security Council. A senior German diplomat told POLITICO that, for Europe, Iran has become a “question of principle” that has as much to do with preserving international norms as it does with reining in the Iranian nuclear threat. European officials are happy to confront the U.S. over Iran at international gatherings, the diplomat said, because they believe Trump can’t rally many people to his defense. U.S. officials regard Europe’s efforts to salvage the Iran deal as little more than bluster, and they believe the Europeans will cave eventually. The threat of U.S. sanctions has, after all, already led dozens of European businesses to quit the Iranian market, despite promises that European governments would protect the firms. The Iranian economy, meanwhile, is struggling. The country’s currency, the rial, has plummeted in value in recent months, and Iranians have staged protests across the country blaming their Islamist government of ineptitude and corruption. And this is all before U.S. sanctions on Iran’s oil sector, which had been lifted under the nuclear deal, are re-imposed starting Nov. 4. Trump quit the nuclear deal in May, saying the Barack Obama-era agreement was too narrow. Trump argued he wanted a better deal that reins in both Iran’s nuclear and non-nuclear activities, including its support of terrorist groups that threaten U.S. allies such as Israel. The Trump administration has since unveiled a list of 12 demands on Iran that would require a radical reordering of Iran’s foreign policy. European leaders are sympathetic to many of Trump’s complaints about Iran. They worry about Iranian aid to terrorist groups implicated in attacks across Europe. France is reportedly restricting its diplomats’ travel to Iran, citing a foiled bomb plot aimed at Iranian dissidents on its soil. These officials also worry about Iran’s military activities in places like Yemen and Syria, both of which are mired in war. But these same allies believe Trump should have built on the nuclear deal instead of walking away from it. They also don’t buy the Trump administration’s claim that it’s not seeking regime change in Iran. They fear the U.S. is doing what it can to collapse the regime without a long-term strategy, meaning more political chaos and human suffering in an already volatile Middle East. Another opposing voice who could stir things up is Iranian President Hassan Rouhani, who is expected to attend the UN meeting despite debate in his home country over whether he should go. Rouhani will have multiple opportunities to rebut Trump. It’s even possible that Trump may ask to meet with Rouhani while the two are in New York. The U.S. president tried to sit down with Iranian officials during last year’s assembly, and he’s said he’s willing to meet the Islamic Republic’s leaders without preconditions. The Iranians declined last year’s request from the Trump administration, which was conveyed through the French. U.S. officials declined to comment on whether Trump was mulling more outreach this year. Mark Dubowitz, chief executive of the hawkish Foundation for Defense of Democracies, argued that Trump should hold out for a meeting with Iran’s Supreme Leader Ayatollah Ali Khamenei, who holds the ultimate power in the country under its theocratic system. Secretary of State Mike Pompeo could be dispatched to meet with Rouhani instead, Dubowitz suggested.